IAW recently hosted a webinar with Emily Kapit on writing a resume and cover letter that will help you stand out in your job search. 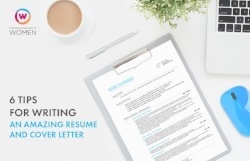 The webinar was so well-received that we have partnered with Emily again to publish an eBook featuring six tips you can use to optimize your own resume and cover letter. craft an expertly customized cover letter. Complete the form on the right to download your copy of "6 Tips to Write an Amazing Resume and Cover Letter."